Coming from Malibiclibic Falls at Aguinaldo, Cavite and from a road trip to Kaybiang Tunnel down to the western coves of Maragondon, Cavite and Nasugbu, Batangas, and an overnight stay at Tagaytay City; early on a Sunday morning, we headed to Cavite's coffee capital... Amadeo, Cavite. What more can this town offer aside from a fresh smell of coffee while driving along Crisanto M. Delos Reyes Avenue? A waterfall. Coming from Manggahan, General Trias and passing by the Gateway Business Park (one of the 2 industrial parks of Cavite), 6.3 kilometers away is the Balite Falls, one of the few waterfalls in Cavite. Balite Falls is a privately owned resort. A 929-meter road from Crisanto Delos Reyes Avenue is the only access to this falls and is accessible to any type of vehicle. The resort is not a top notch class resort yet is one of the nearest waterfall spot for the people of Cavite and those coming from Manila. From Manila, it is only about an hour and a half drive along the Cavite Expressway (Cavitex). Cottages are available along the side of the stream and small overnight hostel is available as well as a bar. However when I was there, it seems that the bar is no longer available except for a karaoke machine. The place is suggested to be a good picnic area but not a place that would be good to stay overnight. Amenities are not that top notch. There is only a single restroom for the whole resort and 3 dressing rooms. There is no shower room as the area already has natural fresh water flowing from the pipes along the side of the stream which can be used as a shower. The water from the catch basin of the falls was artificially blocked by sand bags to maintain the basin with sufficient water for swimming. The bad thing about it is that because it is blocked and it takes time before the water to flow freely to the stream, the catch basin water tends to be murky when more people are there. Anchovies and tadpoles swim along with you. Not in great numbers though. And this is also one of the effects when you block a natural waterway, the fishes tend to stay in one place as well. The falls itself is a beauty. Not something you expect as a big waterfall as it can be safely said that Balite Falls is more of a stream as the area to where it is located is a plain land. There are no mountains nearby. Just right where the falls fall from the rock is a deep area. A rope line has been placed by the management to warn people that if you go beyond that rope and get near the falls is already 18-feet deep. Entrance fee is a bit of a turn-off. With few amenities that the resort can offer, it charges P75 per person for 7 years old and above. Much more expensive than Sto. Nino Cold Spring at Camiguin to which this resort is almost similar; that costs only P25/pax for an entrance fee. The verdict is that, Balite Falls is an ample spot for people who are on a budget and would like to swim or a have a picnic get-together with your family and friends if you happen to just had been to Tagaytay City. From Manila, go to Cavitex and drive all the way to Centennial Highway until you reach Tejeros. Turn right and drive straight until you reach the Gov. Ferrer Avenue of General Trias to which you need to turn right. Drive straight and you will pass by the Manggahan intersection and Gateway Industrial Park. 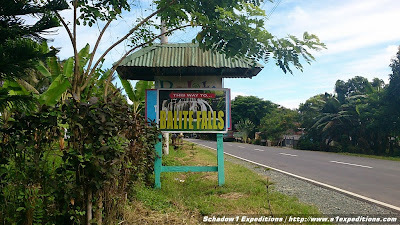 From there, drive 6 kilometers more until you reach the Balite Falls signboard where you would need to turn right. If coming from Tagaytay, just drive to Crisanto delos Reyes Avenue (in front of Skyranch) and you will pass by Amadeo town proper. From there, it is a 7.8-kilometer drive before you turn left to Balite Falls. From Manila, from the Southwest IPTS Terminal at Coastal Mall Paranaque, ride a bus going to Indang or Trece Martires. Drop-off at Manggahan intersection and ride a jeepney to Amadeo. Drop-off at Balite Falls road before arriving Amadeo. From there, it is a 929-meter walk. Our drive to Balite falls has generated GPS traces and has been contributed to +OpenStreetMap Philippines and can be installed on your navigation devices so that you can get to Balite Falls without getting lost.